Will Deacy, a UM systems ecology graduate student under the direction of UM Professor Jack Stanford, researched brown bears on Kodiak Island, Alaska, in collaboration with the U.S. Fish and Wildlife Service. 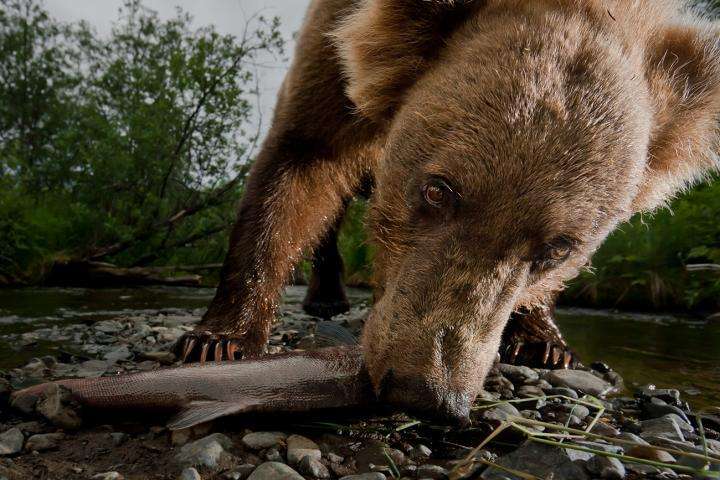 Brown bears are faced with a challenge: They need to consume lots of salmon each year, but salmon only are available for a few weeks in each shallow spawning ground. However, salmon spawn at different times in different habitats, which could allow bears to eat salmon for long periods of time if they move to different spawning grounds. GPS collars allowed Deacy to observe where and when bears foraged for salmon. "We found that the bears greatly extend their use of the salmon resource by migrating from one run to another," Stanford said. "We call this 'surfing the salmon red wave.'" "This research shows wildlife have very sophisticated foraging behaviors," Deacy said. "The bears benefited from variation in spawning timing, which is ultimately created by complex natural watersheds. This highlights the need to conserve complexity in wild places." Deacy conducted his field work over the course of five years in the soggy and remote Karluk area of southwestern Kodiak Island, which is accessible only by float plane. The area has one of the most dense brown bear populations on Earth. It also has hundreds of rivers, streams and lake beaches used by spawning Pacific salmon. The researchers' studies of Alaskan bears are ongoing. They want to understand how human activities, like bear viewing and low-level flying, impact brown bear salmon foraging behavior.